ST. LOUIS – “We are going to stand up, fight back and go to jail for our members – and that is something Peabody can’t buy,” United Mine Workers’ of America (UMWA) international president, Cecil Roberts, told 6,000 mineworkers, supporters, and community activists, as they rallied here in downtown Kiener Plaza on April 29. The rally was held just across the street from Peabody Energy’s national headquarters. Peabody is the nation’s largest and most profitable coal company. According to the Mineworkers, Peabody Energy and Arch Coal created the spinoff company, Patriot Coal, in a scheme to deny pension and health care benefits to over 20,000 union members and their dependents. 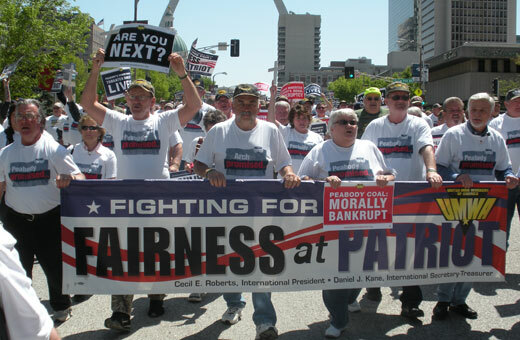 Patriot Coal filed for chapter 11 bankruptcy in July, 2012 and shortly thereafter asked to be released from its promises to UMWA members in West Virginia, Indiana, Illinois, Kentucky and Ohio. Peabody Energy and Arch Coal are both headquartered in St. Louis, Mo and the bankruptcy case was moved to St. Louis last November. Dozens of mineworkers have been arrested over the past few months for peacefully sitting down in the street just outside Peabody’s headquarters. 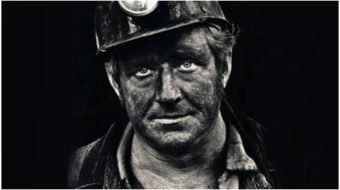 “The promise of lifelong health care for miners and their widows is a sacred moral promise and you can’t get out of it,” Jones said. After the rally, union members marched six blocks to the federal courthouse where Patriot Coal’s bankruptcy case is being heard. Sixteen protesters blocked the street in front of the courthouse, including Roberts and Cohen, and were arrested. 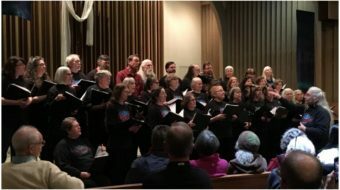 Later that night, faith leaders from all across St. Louis led a 250 person candle light vigil in support of the mineworkers at the federal court house.